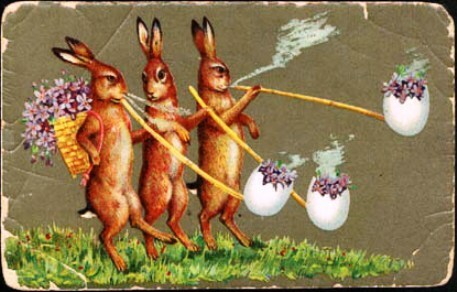 I find that I cannot avoid an offering of vintage Easter postcards even though I’m tempted to skip this particular greeting card occasion. Easter is a fine, joyous (relatively non-commercial) holiday, and you know I love print culture in general and ephemera in particular, but you put it all together and you get too much spring saccharine sweetness: too many cherubic children, too many chicks, too many eggs, too many flowers, too many bunnies. 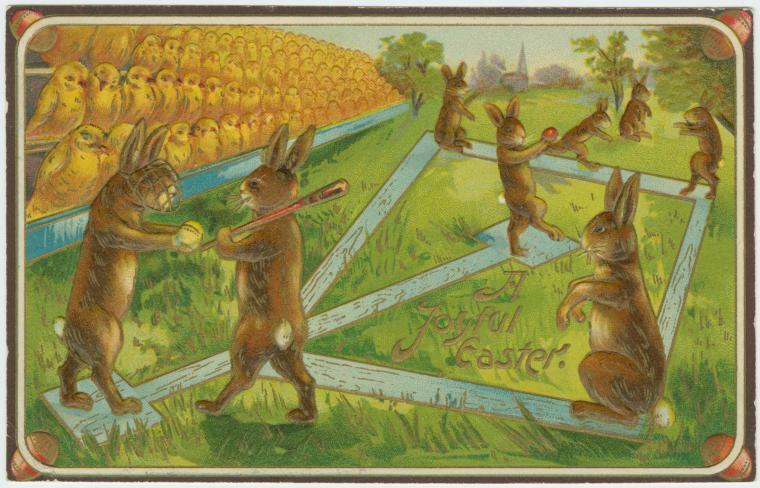 The publishers of greeting cards in the “golden age” of the later nineteenth and early twentieth centuries obviously admired all of these things, but Easter gave them the occasion to showcase all of them together. It’s just too much. Easter cards, which were very popular at this time, are a bit like Christmas cards, in that they represent a religious holiday but cannot be too overtly religious and still appeal to a mass and diverse public. Consequently the religious imagery increasingly fades to the background and cute, secular symbols are placed in the foreground, front and center: Santa Claus and his reindeer, the Easter Bunny and lots of eggs, particularly BIG eggs. Unlike cards for the other popular holidays of the time (and now), Valentine’s Day, St. Patrick’s Day and Halloween, Easter cards cannot be funny, or satirical, as they signify such a serious religious holiday. They can just be cute. 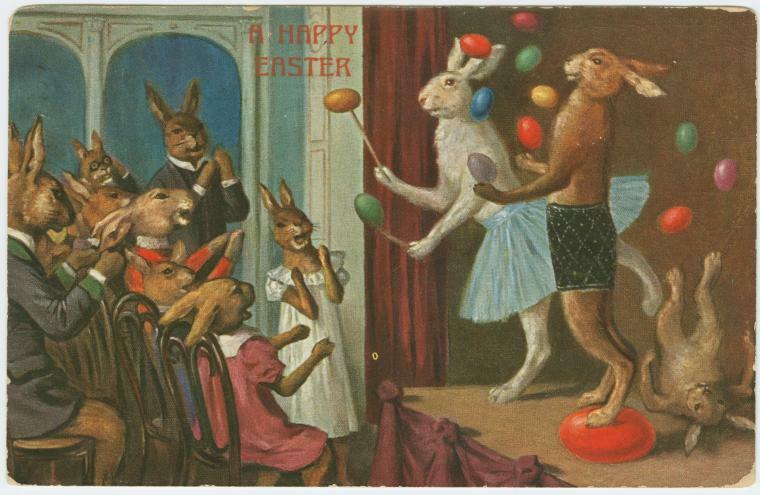 But because Easter cards were popular, and there are so many of them still around from the 1880-1930 period, I did want to showcase a few of the more interesting images. 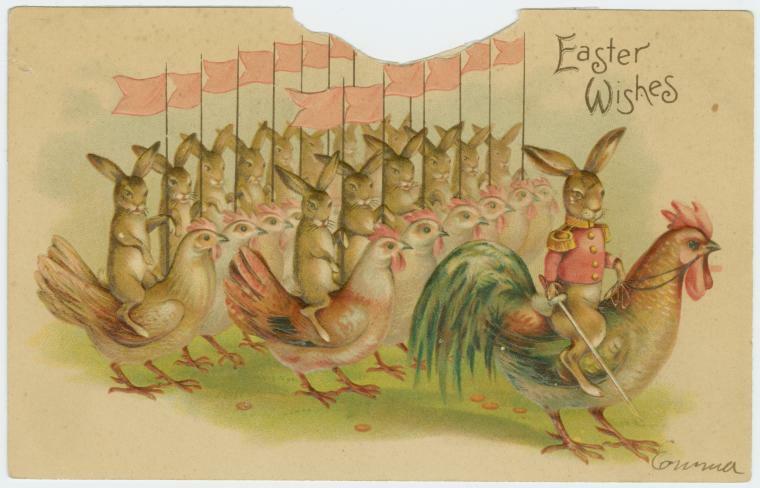 The huge collection at the New York Public Library Digital Gallery has literally hundreds of cards of brightly dressed children popping out of huge eggs, which I have not included here. 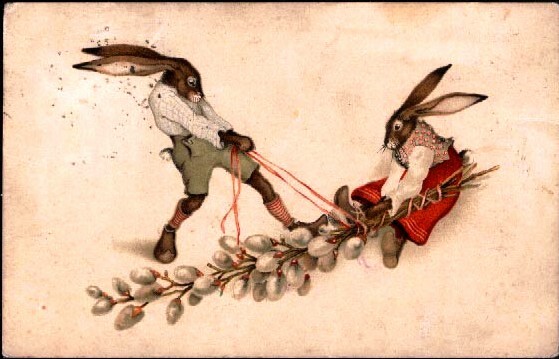 Instead, I’m offering bunnies doing interesting things (generally dressed like humans) and some international examples: very artistic bunnies from France, and some “Easter witches” from Scandinavia. 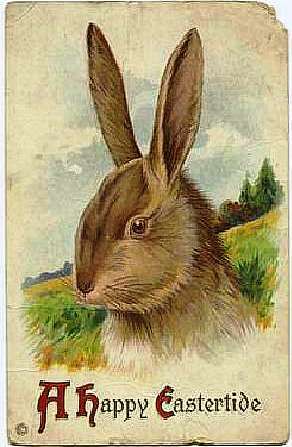 Around World War I there were some oddly-militaristic Easter cards issued both in Germany (which had a huge greeting and postcard industry) and America, and I’ve included a few examples of these as well. Two German Easter postcards (I assume for the Anglo-American market given the English wording) from the decade before World War One, featuring characters dressed in the distinctive Prussian military uniform. 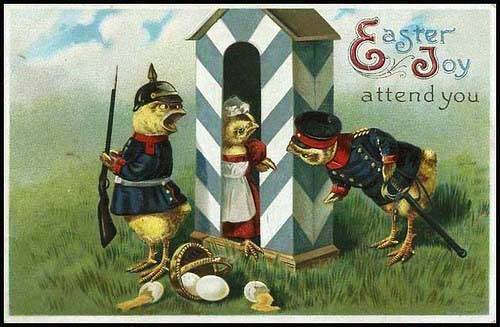 The juxtaposition of Easter greetings and soldiers seems kind of incongruous to me (especially in the first card, where the soldier-chicks are quite menacing), but at least it’s interesting. 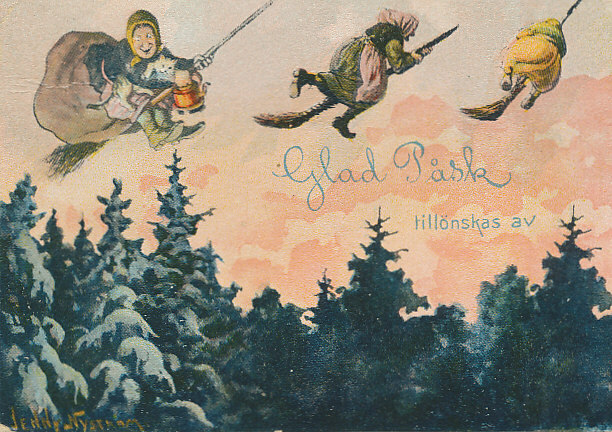 Next up are two vintage Swedish cards featuring the traditional Easter witches or hags (paskkarringar). There are pre-Christian survivals mixed in the observance of most Christian holidays, and in Sweden (and parts of Finland, apparently) this cultural fusion is revealed most strikingly at Easter time. On Maundy Thursday, broom-flying, copper kettle-carrying hags flew to Blakulla, the remote Blue Mountain, to pay homage to the Devil (or some pagan God), and then made a quick turnaround to be in Church on Easter Morning! Swedish children traditionally dress up as paskkaringar two days before Easter, and visit their neighbors’ houses leaving “Easter letters” and requesting treats. Obviously one impact of this tradition was the production of LOTS of Easter greeting cards. You can see more here. Finally, a couple of cards that I just like. A good old American unembellished, unaccompanied Easter Rabbit, and a pair of nicely-drawn French bunnies with pussywillows. This entry was posted on Saturday, April 23rd, 2011 at 8:24 am	and tagged with Culture, ephemera, holidays and posted in History. You can follow any responses to this entry through the RSS 2.0 feed. All lovely and cuddly! The last two look like hares that are jumping., boxing and generally partying in the fields at the moment. Delightful. Happy Belated Easter!! Hope you enjoyed a lovely day!